Editor's Note: Due to inclement weather, the annual Candlelight Festival of Lessons and Carols has been cancelled. The University of Richmond invites the greater Richmond community to celebrate the 45th anniversary of the annual “Candlelight Festival of Lessons and Carols,” Sunday, Dec. 9, in Cannon Memorial Chapel. There are two services offered, one at 5 p.m. and an identical one at 8 p.m. This event is a partnership between the Office of the Chaplaincy and the Department of Music. The James River Singers will be featured for the prelude music which will begin 20 minutes before the singers of Schola Cantorum and Women’s Chorale perform a variety of Christmas carols and anthems. This celebration of Christmas is in the tradition of the “Festival of Nine Lessons and Carols,” which was first held at King’s College Chapel in Cambridge, England on Christmas Eve 1918. 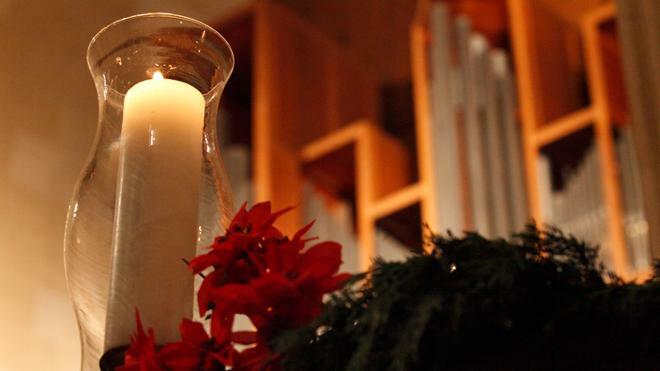 The services will conclude with the singing of “Silent Night” and the lighting of candles by the congregation. The 5 p.m. service typically reaches capacity, so guests who can are encouraged to attend the 8 p.m. service to ensure seating availability.